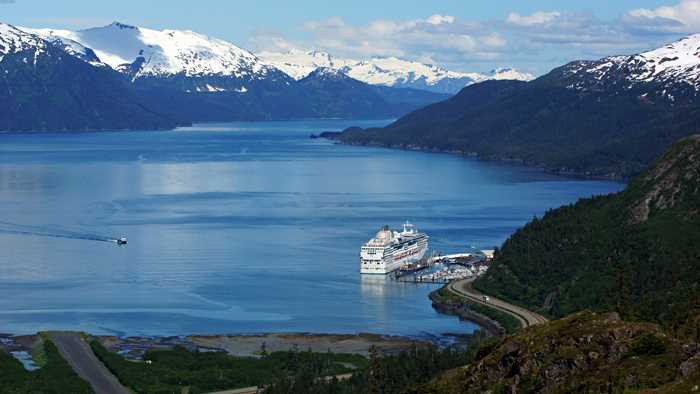 Whittier, Alaska is a strange and wonderful place. It’s a town where nearly everyone lives in one building. It’s a town where you must drive your car through a railroad tunnel to visit. And it’s also a town that’s blessed with natural beauty, while being marked with the ghosts of the past. The entire experience makes a trip to Whittier very worthwhile. You can reach Whittier by car via the Anton Anderson Memorial Tunnel. 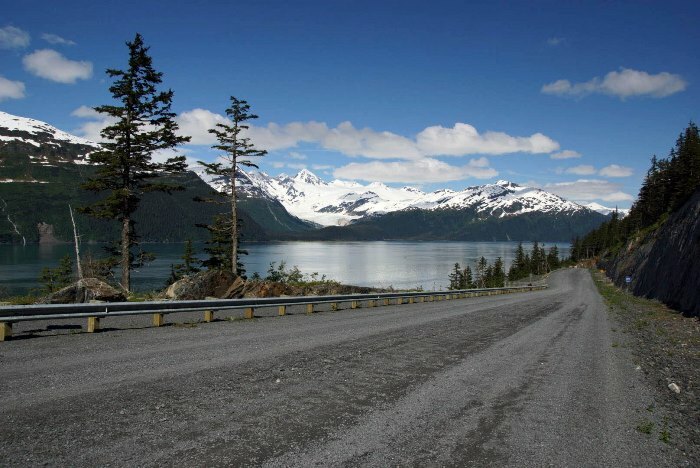 From Seward Highway, take Portage Glacier Road to the tunnel entrance. As of 2016, the tunnel toll was $11 for an average-size car. Traffic heads into Whittier on the half-hour, and out of Whittier on the hour (subject to change, or delay due to railroad traffic). … this is a very common sight. 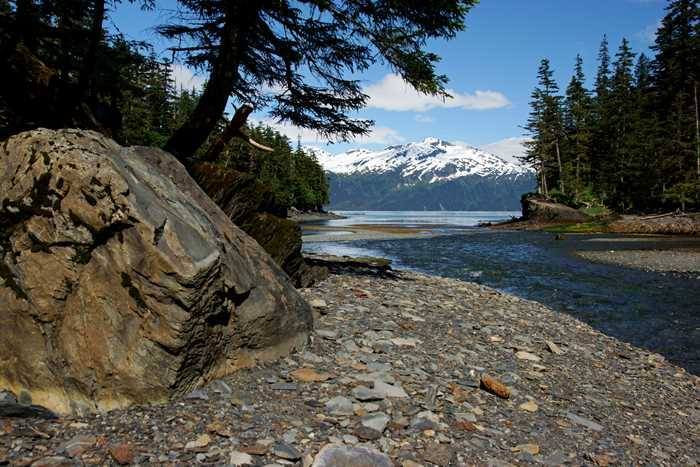 From the town’s most popular trail (to Portage Pass), you’ll get a great look at the view enjoyed by residents of Whittier on a daily basis — okay, maybe not daily, since the weather isn’t always this great. You can’t see downtown Whittier in this picture — it’s just around the corner to the right, while the Anton Anderson tunnel is to the left. I drove through the tunnel and into town, and then drove up and down almost every street. It didn’t take long — there are only a few of them. I should have spent a little more time exploring the harbor area — the narrow strip between the waterfront and the railroad tracks — but at first glance I didn’t see much there besides parking spots and boat charter businesses (and the terminal for the Alaska ferry). I was most interested in checking out the strange hi-rise building that’s home to almost all of Whittier’s residents. 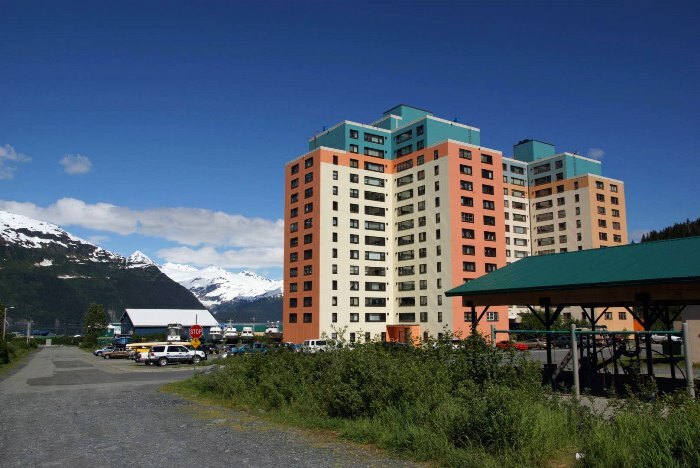 The Begich Towers complex is a remnant from Whittier’s mid-20th century military days. When the military left, the 14-story building was eventually turned into condominiums. It currently has 196 units, including some that are used as a bed and breakfast. I wasn’t comfortable wandering around any of the residential levels, but I did take a look at the first floor. … and even the city’s offices are located here, along with the police station. When the weather is -40 degrees in the middle of winter, no one has to go outside. 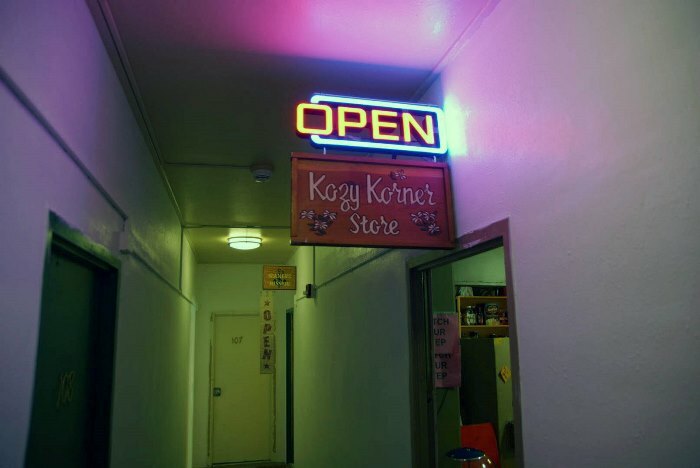 Begich Towers has a strange feel to it. This isn’t a luxury condominium building. 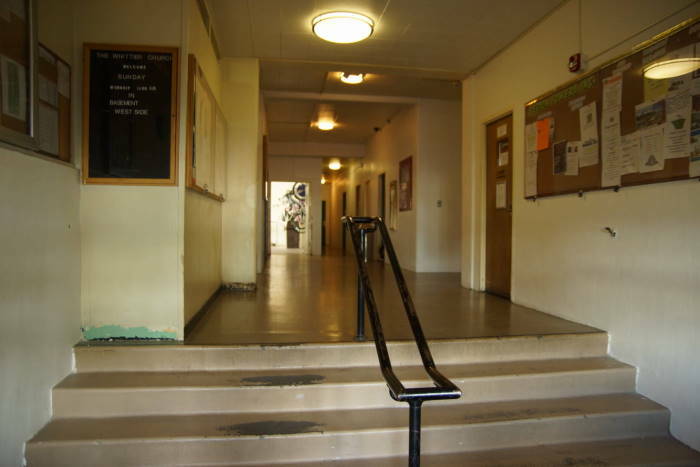 When you walk in the door, it feels more like a junior high school. Everything is quite basic and somewhat unattractive. But, there are reminders that this is a home to hundreds of people. 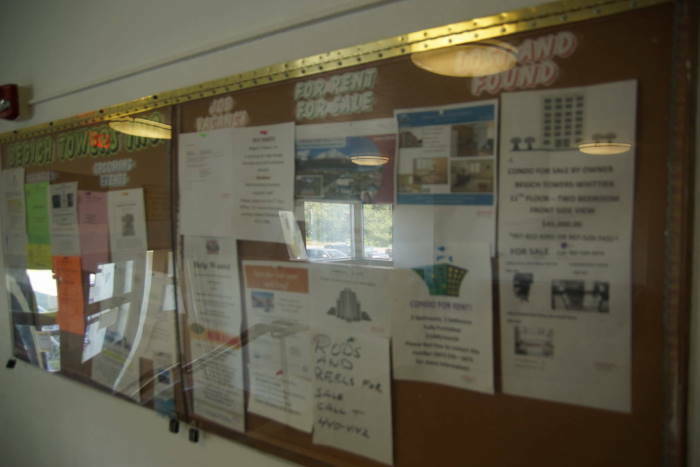 A bulletin board tells of local events, an upcoming garage sale, and even some condos that are available (a two-bedroom with a view of the water was listed for $45,000). A historical sign reassured me that I’m probably not the only tourist to poke around in the building. 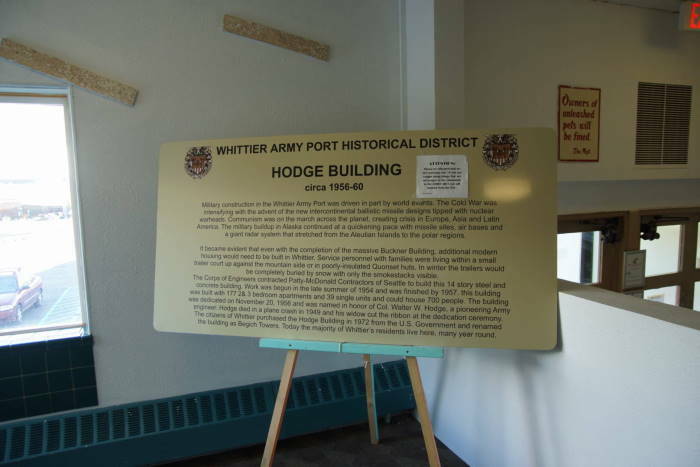 The sign explains how Begich Towers was originally known as the Hodge Building. It was constructed in three parts (thus, the plural on “Towers”, even though it’s just one building). Construction took place between 1953 and 1957. The city of Whittier received the building in 1973. 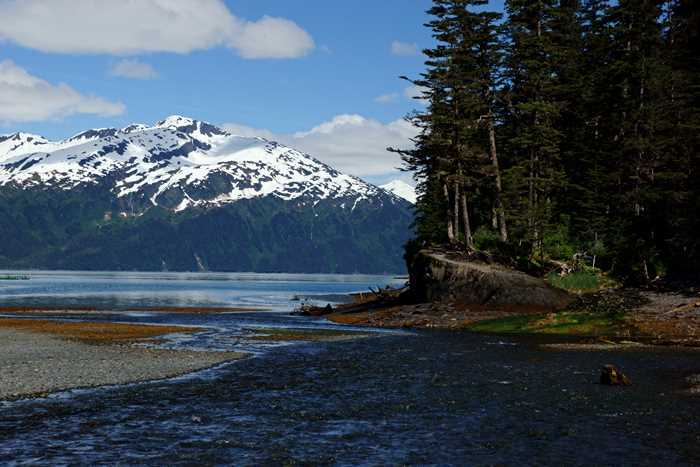 The following year, it was renamed in memory of Alaska Congressman Nick Begich, who died in a plane crash along with another representative, Hale Boggs of Louisiana. 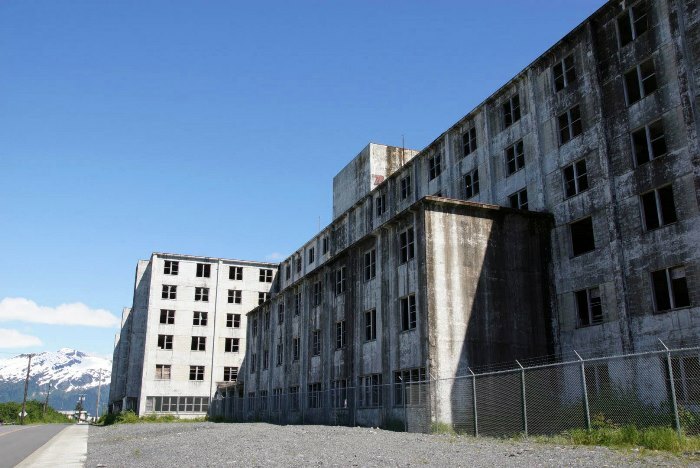 Continue exploring Whittier, and you’ll soon notice another old relic from the town’s military days — and this one hasn’t fared as well as the Begich Towers. On a hillside, overlooking town (and very visible from everywhere) is the Buckner Building. This was the original “city under one roof”, before Begich Towers was constructed. The Buckner Building was the largest building in Alaska at the time — big enough to house 1,000 troops. And, it featured a hospital, bowling alley, and theater, among other amenities. It opened in 1953, but by 1960, it was abandoned by the military, and ownership has changed hands multiple times since then. It seems like there is currently no plan to either tear it down or fix it up. 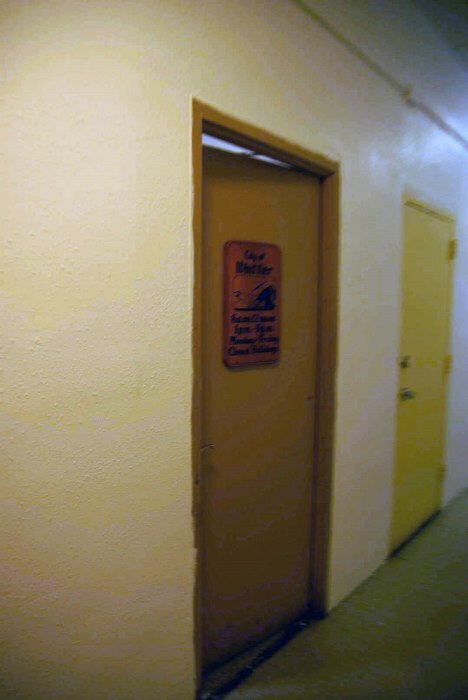 For decades, the city of Whittier didn’t worry about people entering the Buckner Building, but in recent years, it has began charging trespassers. If you’d like to see what it looks like inside, you should check out this video shot in 2012, showing a guy skiing through the building. Drive past the Buckner Building and turn right on Shotgun Cove Road, and it feels like you’ve found another way out of town — for about two minutes, until you come to a dead-end. But, just before that dead-end, there’s a nice viewpoint where you can look back on Whittier, and see part of the town, as well as the cruise port. 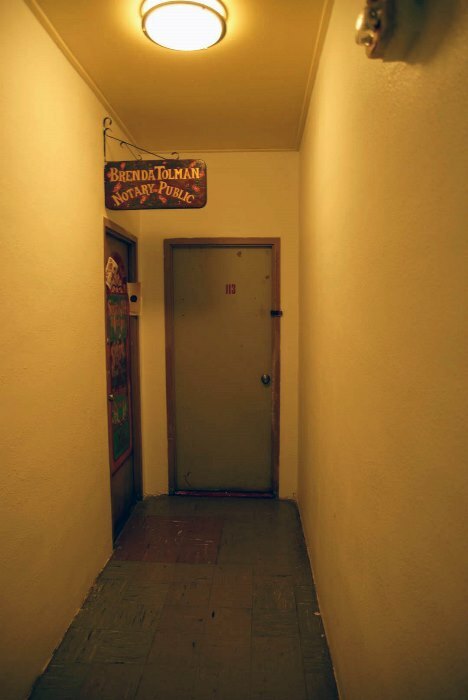 Look the other direction, and you’ll see the dead-end. From what I’ve read, there has been talk about extending this road to Trinity Point, and then around Shotgun Cove to Neptune Point. The extension of just a few miles will likely cost millions of dollars and take decades to complete — if it ever gets done. 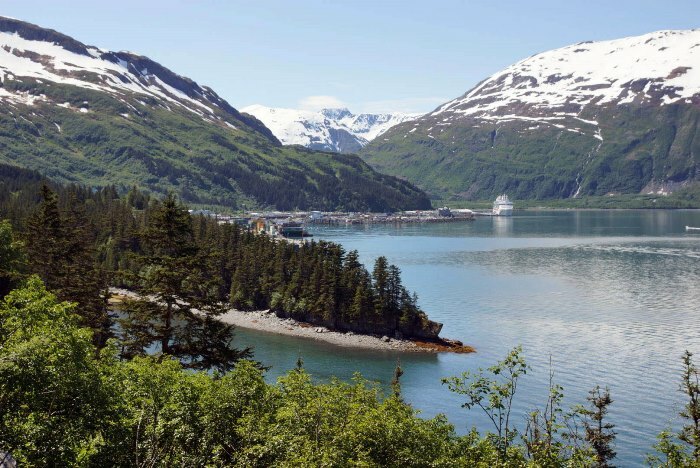 The city of Whittier would like to build a new residential area out there, and possibly relocate the Alaska ferry terminal. But for now, work has centered around making the current stretch of Shotgun Cove Road fancier than any other road in Whittier. Even though there isn’t a road to Shotgun Cove, there is a trail, which begins at the end of the current road. It’s a six-mile round-trip, and I’ve read that it’s fairly easy, except for two spots where you must ford a creek. The current length of Shotgun Cove Road provides access to a very beautiful little spot. Before you go over the hill and reach the end of the road, watch for a turnoff to a picnic area. This is the outlet of Cove Creek, and it’s a hidden gem of Whittier. Climb down from the viewing platform to get closer to the water. You might be able to hop all the way over the creek, if you find the right spot. I’ve read that the creek is popular with fishermen, but all I caught were some good photos. For a tiny town, Whittier is very interesting to explore. It’s definitely worth the price of admission (the $13 toll for passage through the Anton Anderson Memorial Tunnel). Spend a couple of hours exploring the town, then hike up to Portage Pass, and you’ll have a great day. Take That Trip to Alaska! #10: Denali: The Big One.